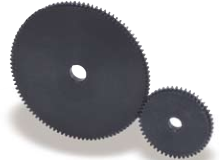 The SSAY Hubless Spur Gears are made from carbon steel and are NOT hardened. These Spur Gears are designed with a narrower face width than the SSA Series Spur Gears. These Spur Gears are suitable for light-duty applications. These Spur Gears are easily customizable.